Ken Murray - Outstanding article. You always have great posts. This one is of extreme interest to me. to focus on the Mena, Arkansa Drug Cartel of Clinton and Bush I. Last edited by Bruce Patrick Brychek on Tue Jun 09, 2015 6:19 pm, edited 2 times in total. Ken - Outstanding article. You often have great posts. This one is of extreme interest to us. Make sure you study everything that you can about the CIA and drugs from Viet Nam on. And make sure to focus on the Mena, Arkansa Drug Cartel fo Clinton and Bush I. Thanks for the kind words Bruce. I owe alot to Bob for bringing me up to speed on the Clinton-Bush connection in Mena with his posts when I first came aboard here. Terry Reed, Compromised: Clinton, Bush and the CIA, Spy/Shapolsky, 1994. Bill Clinton and Oliver North arguing in a Mena Bunker. In the shadows Felix Rodriguez/Maximo Gomez who got Che. Barry Seal is set up. Terry Reed survives frame-up, assassination attempt, all for helping the lower-receiver manufacturing problems encountered circumventing the Boland Amendment. Mike Ruppert of From The Wilderness once complained Reed was "so hard to get a hold of"--well, duh. And later George W. Bush referred to Johnny Sutton as "a good friend of mine"--Sutton who gave immunity to Aldrete-Davila and eleven- and twelve-year terms to Ramos and Compean--can't interrupt the drug flow. Obama in Pakistan with Mian Muhammadian Soomro. A little blow but never heroin. And we're getting out of Afghanistan. Phil Dragoo wrote: Terry Reed, Compromised: Clinton, Bush and the CIA, Spy/Shapolsky, 1994. Or not is right Phil. Excellent stuff there. AND THE JFK RESEARCH COMMUNITY HAS STILL NOT CAUGHT UP WITH HIM IN 2010. My Opinion. this now are either members of, or constant visitor's to. author directly, I can not recommend a book more highly. It is also an excellent and compelling read. road ? Then I would like to have lunch with you and Sirhan Sirhan if possible. Let's follow-up by PM on this. Last edited by Bruce Patrick Brychek on Tue Jun 09, 2015 6:34 pm, edited 1 time in total. I live in California. I'm in the process of switching careers once again. After I get the new job I would love to visit Files and you in Illinois. Wim has a great deal for $100 where you get several dvds including the Judith Baker dvd and the book, Files on JFK. I'm going to get them next month and after studying them I'll be able to have an intelligent conversation with Files. Because of the info that is in my head, Files can say one thing that might not mean to much to another but it will click in my head. This happened with my correspondence with Sirhan Sirhan. He told me that his memory is coming back and that he remembers going back stage and a male with broad shoulders and a firm voice handed him some papers. I knew exactly what those papers where. I wrote Sirhan that those papers were found on his person after his arrrest and designed to show pre meditation and stalking of Kennedy. I sent him the evidence report. Michael, your mention of broad shoulders and firm voice calls to mind the description from Manchurian Candidate applied to David Atlee Phillips as being "theatrically handsome". Have just finished the part of James Douglass' JFK and the Unspeakable regarding the Oswald impersonator in Mexico City and all of that dog-and-pony show wherein Helms was so helpful in providing Johnson with fabricated evidence. Good luck to you and Bruce and James in the Land of Lincoln. Does Wim see Johnny Depp in the screenplay. And in the pantry of the Ambassador is as much action drama as Tom Cruise moving through the club in Collateral. Morales saw himself as the action figure of the day, but his sordid thuggery is only a hanging curve for today's researchers--spotlight on you fellows--to crack it out of the park and into the record books. Denial is banished by the truth splashed on all the widescreens of the world's mind. Now this is why coming to the forum is so fascinating. Great stuff, Michael, would really love to hear what you've got on this from A-Z. Do tell! 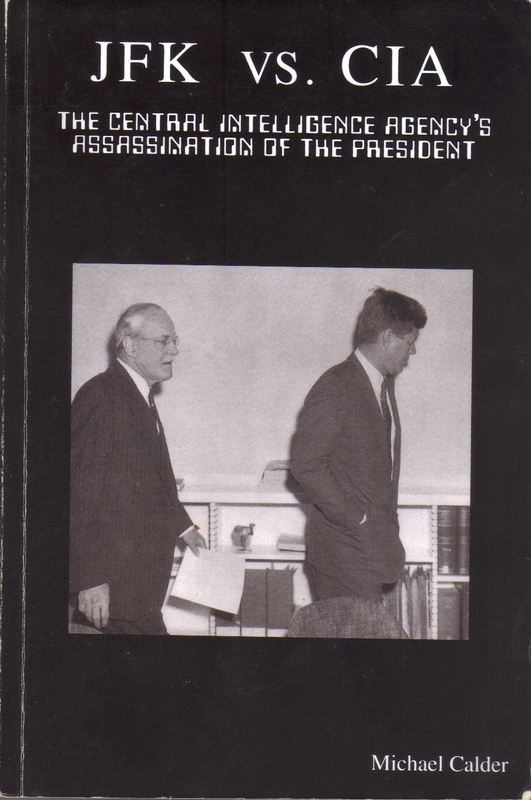 book, JFK vs. CIA by Mr. Michael Calder. Federal Reserve, the economy, etc. similarities between JFK and Obama as we approach Obama's first 1,000 days in Office. Last edited by Bruce Patrick Brychek on Tue Jun 09, 2015 6:41 pm, edited 2 times in total. I have recently ordered and received your book after reading the reviews here. Family members and myself are history buffs, and we study U.S. Presidents and events that occurred in their terms, including wars. The title of your book, and the reviews here going back to 2006 really caught my attention and curiosity. Also, I understand from reading above that you are a member and have conversed with other members here. One writer really seems to comprehend your work well. You and some of these members have shown uncanny insight to this material. I am only half way through your book, but it is incredible. I am glad that I read the reviews here. I know that my eyes are really being opened for the first time about this subject matter. Thanks for reading the book. Any clarifications needed be sure to post a question to me. I wanted a brief book, not verbose, and went to the heart of the matter. If interested in the RFK murder there are some essays and documents that might knock you backwards at my web site www.jfkcia.com The best way now to strike back at the Empire is to get Sirhan Sirhan out of prison or explore the 9/11 attack on New York City. Still, treason never rang louder than Nov 22, 1963 and has made all that came after possible. 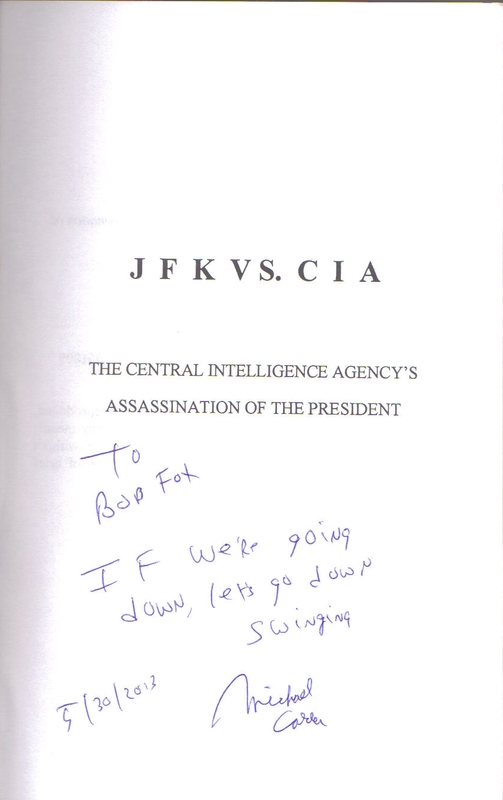 03.22.2006 - I first Posted this Headline about Michael Calder's excellent book, JFK vs. CIA. Thankfully Michael Calder has become a Regular Member of JFKMS Forum, and a frequent contributor. This provides an excellent opportunity to communicate with him here regularly. knowledge on The RFK Subject Matter. to Pouty's book, along with Garrison, Lifton, Groden, and Dankbaar. My Opinion. book is an exceptional Work Product and worth reading if you have not. Fast Forward to 9+ years later. opportunity to communicate with Michael here directly. In addition, Michael has been conducting Private Interviews with Sirhan Sirhan for well over a decade. Michael is also a wealth of knowledge on the Subject Matters of RFK and Sirhan Sirhan. I wholeheartedly agree with Bruce that JFK vs. CIA by Michael Calder is a fantastic book. I have read many books about the JFK assassination and this book rates up near the top. Michael was nice enough to send my son Andrew and myself copies of the book a couple year's back. Michael is right. If we're going down, let's go down swinging.